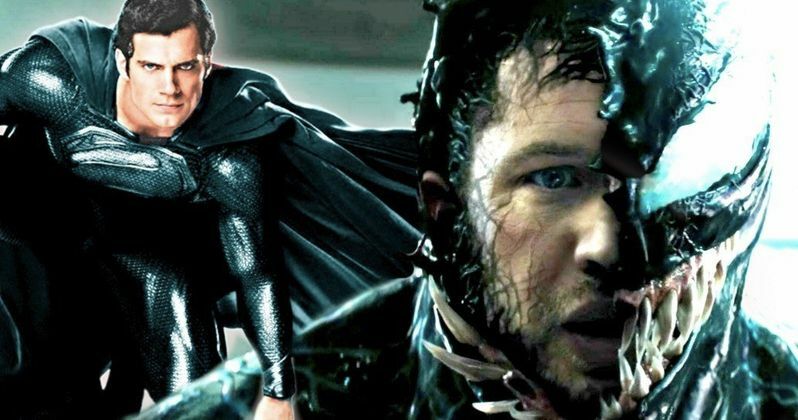 The Venom movie contains a reference to Superman, but does the Man of Steel really exist within Sony's new Marvel universe? Ruben Fleischer's film just hit theaters and there's definitely no sign of Spider-Man in the movie, which has some Marvel fans divided. There's only one mention of the web slinger and it doesn't happen until the very end of the movie with a clip from the upcoming Spider-Man: Into The Spider-Verse animated project, which doesn't really count. However, the Superman connection has some fans talking. There are SPOILERS for Venom below, so read ahead at your own risk. After Tom Hardy's Eddie Brock and the symbiote break into the TV station to provide proof of Dr. Carlton Drake's illegal activity, Brock is ambushed by the Life Foundation. It's at this point in time when Brock's ex-fiancée Anne Weying sees the symbiote take control for the first time, leaving her shocked. After the two escape, Weying tries to talk to Brock about what is happening to him with the symbiote adding some comic relief. Brock reveals Venom has a weakness to sonic attacks and the symbiote mentions fire attacks as well, which leads to Weying stating that those attacks are the symbiote's "Kryptonite." Alright, so the mentioning of Kryptonite in Venom isn't the biggest of Superman reference, but it does reveal that the character exists within the universe. It's not clear if the Man of Steel is a fictional character like he is in real-life, or if he's a real superhero fighting crime. Regardless, it's a cool wink to another comic book and studio, which should be pretty exciting for comic fans to see, especially since there's no Peter Parker to be found. Superman is one of the most popular superheroes in history, so the reference in Venom makes sense. Kryptonite is often referred to when discussing a weakness and has become a part of popular culture in the last several years. With that being said, the reference might not even be a nod to the Man of Steel at all, but that's kind of hard to believe since it is a pretty big comic book movie. Venom is on track to be the number one movie at the box office this weekend, having earned over $32 million thus far. The film has taken a pretty good pounding from critics, with most reviews wishing that the movie went further with the symbiote's darker side. Many feared that the PG-13 rating was a poor decision, and the latest reviews have more or less confirmed that fear. It still looks like a sequel will happen, though that has yet to be confirmed at this time. Carnage will fully introduced if the sequel gets made, which is a huge selling point for comic book fans. You can get more information about Venom as well as updates about a possible sequel over at the official Venom website.